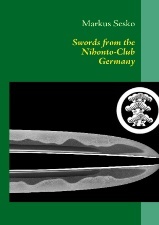 This catalogue records a selection of the blades from the Nihonto-Club Germany. But it is not just an illustrated list but offers sound and considerable informations to each blade, its characteristics, and its maker and/or school. Listed are 40 blades of which twelve bear the status juyo-token. The sequence is as usual, speak Koto-gokaden, Koto blades of other provinces, Sue-Koto, Keicho-Shinto, Shinto, Shinshinto, and Gendaito.